Should I create original content or curate content from others? Many content marketers don’t EVEN consider this question. They worry that curated content is NOT as effective as original content. Even worse, they assume that curated content is of lower quality. 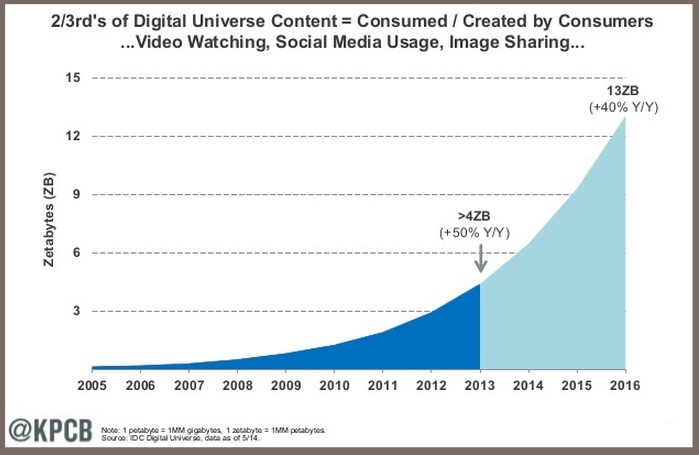 In 2013 we consumed over 4 zetabytes of digital content, a number so large that a new term was needed to describe it!!! This quantity of content represented 50% year-over-year growth and is expected to triple by 2016 according to IDC. 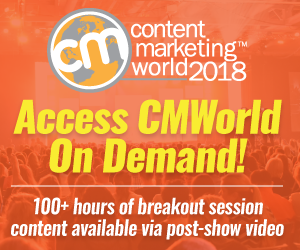 We marketers know there’s a ton of content available in today’s always connected, always communicating world. Heck, we’ve created a good deal of it. Yet, roughly 67% of this digital content is created and consumed by customers according to Mary Meeker. As a result your lovingly created content is competing against updates from your prospects’ family, friends and colleagues. Not such a rosy picture for your original content’s ability to get noticed. Therefore the challenge for marketers is: How do you get your content to stand out enough that to attract an audience and get them to take action when it’s mixed with other more relevant information? 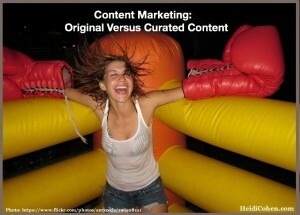 Hence content marketing’s original versus curated content debate. 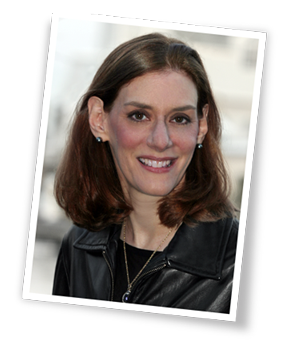 Can your afford to blow your entire budget on expensive high quality information? Will your original content attract and convert your key target audience to purchase your offering? To gain some insights based on what other marketers do in sharing original and curated content, Argyle Social analyzed 150,000+ tweets and status updates from over 1,000 Twitter, Facebook and LinkedIn client accounts between November 2010 and July 2011. Most of the data was from professional marketers. 30% of companies were curation-focused; they linked to third party websites in 75+% of their posts. 3% of companies were original content-focused; they linked to their own content. Argyle Social discovered that marketers fell into one of 3 distinct, original versus curated content categories based on their social sharing. Curators link to third-party sites 75% or more of the time. Balanced marketers link to third-party sites 50-75% of the time. Although they yielded 20% less clicks per post than curators, their conversion rate was 10X better!!! Self-Promoters link to third party sites 50% or less of the time. Top 5 companies at generating the MOST CLICKS linked to their original content 37.9% of the time. Top 5 companies at generating the MOST CONVERSIONS linked to their original content 41.6% of the time. Actionable Content Marketing Tip: Ideally link to original content 40% of the time. Posts with curated content links generate 33% more clicks than original content links. Rationale: Your followers believe the content you curate is more reliable than when you promote your original content. Actionable Content Marketing Tip: Share a mix of original and curated content to build trustworthiness. Posts with original content links yield a 54% higher click-to-conversion rate than posts with curated content links. Rationale: When your followers click through to your original content they’re focused on taking action. Actionable Content Marketing Tip: Be strategic when selecting the original content you share. Know the action you want readers to take. Provides unique, original content that stands out for your target audience. This original content attracts prospects and customers. Is tailored to your target market. Original content is targeted to your specific marketing persona and as a result it resonates with them. Supplies the 5 basic types of content customers seek. Give your prospects the product information, answer their specific questions, and show them how to use and style your products. Shows your business’s knowledge, expertise and experience. Original content can showcase your products and services as well as your employees and customers. Integrates your brand consistently and seamlessly. Original content incorporates your brand’s distinct voice, language, tone and visuals. Can be reused in different iterations and adapted for specific platforms. By planning ahead, you can extend the life of each piece of original content and make it contextually relevant for each platform where it will appear. Doing so while creating the content, reduces content creation costs. Is developed and optimized to target your keywords. This supports your organic search efforts, the largest driver of traffic over time. Builds trustworthiness. By involving influencers and fans, curated content attracts and engages your key audience(s). The subtext is a tacit endorsement. This makes curated content a win-win. Includes original content. Often marketers overlook the fact that curated content can be composed solely of original information that’s never been published elsewhere. Think roundup posts and group interviews. Here’s how Lee Odden curates epic content. Extends the useful life of your original content. At the heart of an effective curated content strategy is effective digital asset management. Joe Pulizzi makes this point in his announcement about hiring a content curator. Provides implied customer ratings and reviews. Through the presentation and incorporation of your customers’ images, videos and comments, curated content shows their unstated but positive endorsement of your products. Supports search optimization. 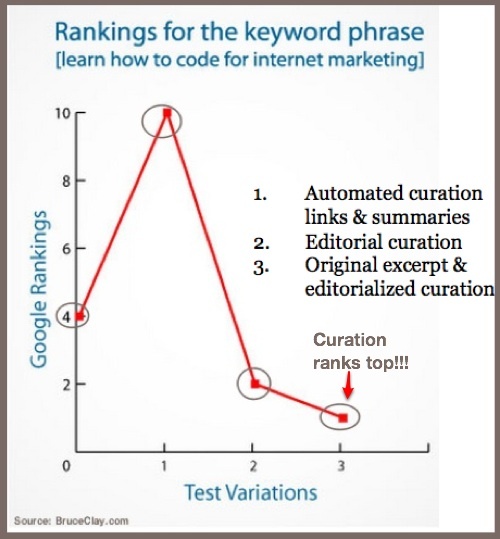 Contrary to popular belief, research by Bruce Clay revealed that curated content supports search optimization if it includes original commentary and links to the original source. Extends your content distribution and reach. By involving influencers and followers in the creation, your curated content naturally attracts their promotion of it. Of course, to maximize results, it’s critical to notify the people included in your content. Positions you as a tastemaker in your market. By selecting the best of the content in your niche, you become known as a go-to resource. Original content has the following disadvantages. Is expensive to create. With limited resources, original content requires both manpower and resources. Overlooks your evergreen content. By being overly focused on new content creation, you forget to promote and re-envision your seasonal content. Needs to be optimized for consumption and search. Just creating content isn’t enough. You must make it attractive with additional content formats like photos, videos, audio and presentations. It also must have a great headline and be search-friendly. Manage existing content assets. Many content creators underestimate the value of auditing and managing their existing content assets. Optimally, you should do this each time you create new content. Requires effective distribution. Creating original content by itself isn’t sufficient to attract an audience. You must distribute it broadly across owned, social and third party media. Curated content has the following disadvantages. Only curate other people’s content. You neglect to highlight your original content. Variety is key to the use of content curation. The power of content curation is providing a balance of other points of view. Forget to add original commentary to curated content. Without a human touch your curated content is just content aggregation and doesn’t help to achieve your content marketing objectives. Can feature your competitors. Care needs to be taken when including competitive content. Ensure that it shows your competition fairly without taking away from your products or services. Overlook the need to incorporate a call-to-action. As with any marketing, it’s key to tell your prospects the next action you’d like them to take. Underestimate the need for resources to curate content. While curated content tends to be less expensive than original content, it requires resources to enhance the content for consumption and to incorporate digital asset management. Original content is important to achieving your content marketing objectives since it builds your brand while providing the information your target audience needs and seeks before, during and after the purchase. That said, original content requires creation, optimization and distribution support. By contrast, curated content draws influencers and your customers in by integrating their information into your content. Don’t underestimate the need for human selection, commentary and optimization. Unlike original content, curated content has a built-in base of supporters who will help distribute and add trustworthiness to your content. This helps it break through and get read. Both original content and curated content have their advantages and disadvantages. Therefore, to attract the maximum audience that yields the best conversion to quality lead generation and sales, use a mix of original and curated content. What is your mix of original and curated content? How does it perform for your business? Tags Bruce Clay, Curated content, Mary Meeker, Original content. Bookmark the permalink. If content is the food by which you nourish your audience or community, why is there an argument at all? If there is great content that my audience would value, I don’t care if I wrote it or someone else did. Let your audience be your guide. We have clients that simply don’t content as others, so curating great content from other sources adds value to the relationship they have with their community. We have other clients that are thought leaders, so their content stands on its own. If your goal is to serve your audience or community, you will provide them with the best content regardless of its source. Serving them will always produce the best return. This article is terrific. Thanks for sharing your insight on the value of both options. While we at PublishThis have long advocated what we call “Content Mixology”, which encourages each brand to find the right mix of original and curated content, we also go deeper to mix at the micro level; in other words, most content is a mix of original and curated content if you add links and ideas from other content that is part of your research when you compose. By embracing a union of both original and curated, you can gain a mix of the benefits you so carefully outlined. Thanks again for the excellent read! That’s probably one of the best articles I have read on curation vs. creation in a long time! I love how you laid out the benefits and disadvantages. Part of my re-focus has been on curating a lot more than I used to. I have been a curator for years, but creation had always taken most of my time. Now, I am going to go the other way. I know it works. This is something we’ve been considering for a while. As Kostas said, it was originally an iffy topic because we didn’t know if it’d be considered to be duplicate content. You’ve provided a lot of great tips here, and this is perfect to refer to as we try to work this into our content marketing plan. Thanks, Heidi! Super interesting topic here. Heidi, we’re actually working on a report on this very subject to be released this or next week with some brand new data (cc @kyleplacy:disqus). I’d love input from both of you or even a quote to include in our report. Great article Heidi, we’ve seen a lot of our recent customers at Goodbits.io start to collect curated content and build newsletters in addition to their created content strategy. We’re working on analytics and data to determine how curated content has performed to those businesses so reading this article was very insightful. Thanks. Interesting debate Heidi. I am first to admit that initially I didn’t properly understand the value of curated content – I dismissed it as duplicate content. I’ve certainly wised up these days and I do think that it is a useful tool to add to your arsenal. I think a weekly curated post is a nice frequency. We are having this debate internally and I was wondering if you had any data more recent than 2010-2011? I’m with you. I’d also like to see more recent data. Perhaps Argyle Social could analyze it. Based on my experience, I’d expect a balanced approach to still outperform either a highly curated or self promotional approach in terms of conversions. The rationale: You need to provide your audience with a mix of information on social media. I recommend focusing on conversions since this is what yields sales and other key metrics.